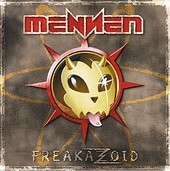 Mennen is a hard rock outfit from the Netherlands who sound a lot like those big haired rock bands that get the VH-1 treatment as of late. This quartet's 14-track album melds the kind of hooky chorus meets guitar virtuoso stamp that bands like Europe and Dokken made infamous. While there's not a whole lot of thought provocation going down lyrically here, the basic rhyme schemes and contents are explored and aren't as forced as you'd expect. The one thing that FREAKAZOID excels at is that it is a very well composed album, sounding like a classic Scorpions or Def Leppard release, thanks to the production work of Erwin Musper, who worked with both bands before. But, like most of the genre's offerings, Mennen play loud at times and heartfelt when it's time to flick the Bic, but don't convey much in the way of substance. But, if you're looking for a hard rock tour de force where you can leave your deep thoughts at the door, Mennen is the band to go to. Mendoza Line, The: Lost In Revelry Menomena: I Am The Fun Blame Monster!